Bubbles in Istanbul, installation view. Photo: Işık Kaya. Courtesy of the artist and Dirimart. Dirimart is pleased to announce Czech artist Jiri Georg Dokoupil’s exhibition in Istanbul. 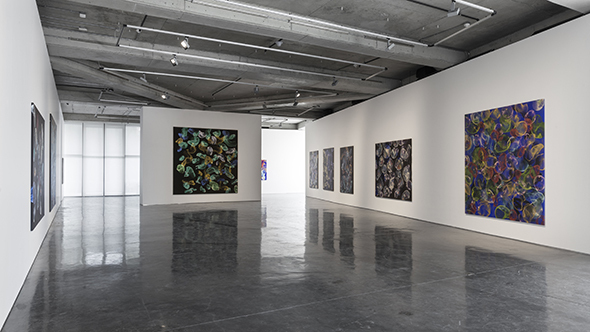 The exhibition is comprised of recent paintings created between 2013 to 2016 the artist’s “Soap Bubble Series,” which has been working on since 1990′s. In this series, Dokoupil redefines figurative art, articulated through his unique method of working. Jiri Georg Dokoupil is one of the founders of the German “Junge Wilde” collective. When he first started to get recognized in the art world at the beginning of the 80s, he was identified by his non-traditional working methods. His hundreds of working methods that shifted from exhibition to exhibition, which were consequences of his neo-expressionist and avant-garde approach, transformed into the “Soap Bubble Series” in which chemistry and art converge. In the “Soap Bubble Series,” the shiny bubbles that the artist has formed by combining soap solvent and pigments burst on the canvas to leave abstract marks. While at the beginning the artist appears to paint the bubbles, in reality, he creates them. The traces of the soap bubbles on the canvas is the surprise encounter between chemistry and art. The abstract forms that the artist creates include endless possibilities. The electrically bright and organic bubbles evoke a lightness in the viewer while drawing them in. The hypnotizing circular movements trigger a curiosity about the vast mystery of underwater life. While the canvases appear to resemble each other, they are all actually individually unique, just like fingerprints. Jiri Georg Dokoupil (b. 1954, Krnov). In 1976 he studied at the Academy of Fine Arts, Cologne and attended classes at the Universities of Frankfurt and New York’s Cooper Union. His work is in the collections of Neue Galerie, Berlin; Staatsgalerie Stuttgart; The National Museum of Contemporary Art, Seoul; Kunstmuseum Horsens, Denmark; The Rubell Family Collection, Miami, FL; Société General Collection, Paris; Migros Museum, Zurich; and Centre Georges Pompidou, Paris. Dokoupil, lives and works in Berlin.